In a significant departure from past practices, the city of Arroyo Grande will disband three of its citizen advisory bodies, drawing criticism from the volunteers who serve on them. The City Council voted 3-1 at an Aug. 14 meeting to move forward with an ordinance to dissolve the city's Traffic Commission, Parks and Recreation Commission, and its Historical Resources Committee. The decision was made as part of a package of cost-saving measures laid out in the city's budget. While the move will save the city money and staff time, that appeared to be little consolation for some of the commission members who attended the meeting to argue in favor of keeping the three advisory bodies. MAKING A CASE Arroyo Grande is moving forward with plans to disband three citizen advisory commissions. 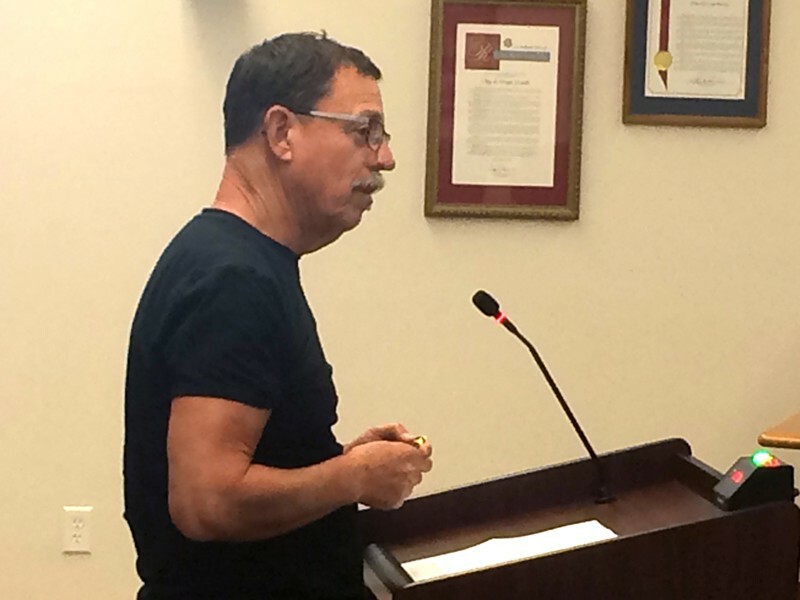 Arroyo Grande Historical Commission Chairman Bill Hart (above) argued against the decision at an Aug. 14 meeting. "This is kind of like being dumped by your boyfriend and you're not ready," said Shirley Gibson, one of the five members of the Historic Resources Committee. Advisory bodies like the commissions don't have the power to make policy, but they do hear testimony from the public and consider needs and issues brought to them by members of the community. They can make recommendations to other boards like the Planning Commission and the City Council. City Manager Jim Bergman said disbanding the three commissions would offset staff cuts to the city's parks and community development departments. Those cuts were made to help close a $900,000 gap in the city's budget. "Quite frankly, this is a difficult recommendation to make," Bergman said. Eliminating the commissions will save about 30 hours of time for staff each month. Staff used that time to generate reports, public notices, and staffing meetings for the three commissions. Bergman said those 30 hours represent an estimated $30,000 a year in salary and benefits. According to a city staff report, other commissions or city departments would essentially absorb the duties and responsibilities of the disbanded commissions. In a presentation to the council, Bergman also noted that all three commissions have canceled more than half of their meetings scheduled for the calendar year. A staff report stated that many of the city advisory commissions were formed in the 1970s and '80s, when residents had fewer ways to communicate with city officials about important issues. Since then, social media, email, and other platforms have expanded that ability, Bergman argued. "Change is hard, but all organizations do it," he said. But the appointed volunteers who staff the commissions weren't sold on the idea. Historical Resources Committee Chairman Bill Hart said getting rid of his commission sent a bad message to the public. "What does it say to our community members in this historic city when we get rid of this committee?" he asked the council. Kenneth Price, who sits on the Traffic Commission, called the recommendation shortsighted and said it was a "step too far." "I think we are a really worthwhile commission, and I am disappointed that this is the way they are going," Price told New Times. "My experience is that, over the years, we've been able to provide information that [the city] hasn't thought about or hasn't thought through." Councilmember Caren Ray was the lone vote against the recommendation. She worried that getting rid of the commissions would hurt the city's ability to communicate with residents. "I'm telling you right now, I'm not sold on this," she said. The council members who voted in favor of the recommendation­—Barbara Harmon, Tim Brown, and Mayor Jim Hill (Kristen Barneich was absent)—indicated that other methods, such as holding focused community and stakeholder meetings on specific issues and projects, could better fulfill the functions of the commissions. "I think this is a paradigm shift," Harmon said. "It's a new reality." Brown agreed, and noted that council could always vote to bring the three advisory bodies back at a later date. "If we find out that this doesn't work, it's not set in stone," he said.